No fewer than seventy (70) members of the People’s Democratic Party (PDP) members in Ikeja area of Lagos on Friday defected to the ruling All Progressives Congress (APC). 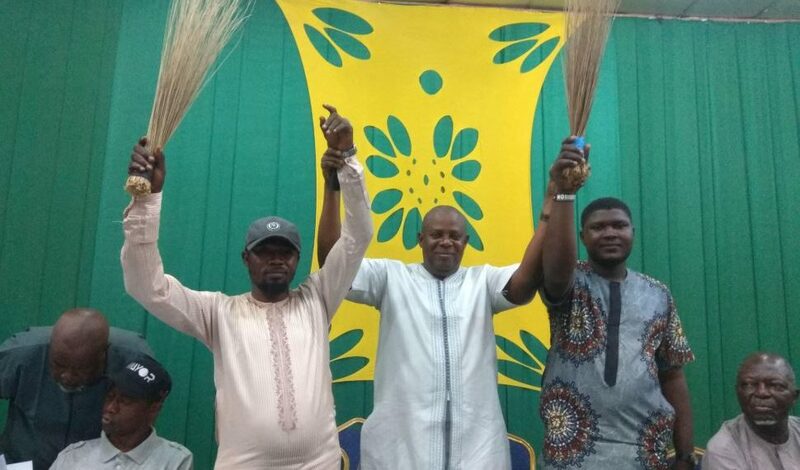 Led by Obanla Adewale, the PDP Youth Leader in Ikeja Ward B and a former councillorship candidate, Obatunde Akanbi Olusesi, they were received by APC Ikeja House of Representatives-elect James Abiodun Faleke at excellence Hotel in Ogba. The duo and over 70 members who defected to APC openly tore their PDP membership card. They collected brooms from Faleke and waved them to the admiration of the crowd that filled the hall. Adewale said he defected to APC due to anti-party activities of the PDP leaders in Ojodu area of Ikeja. He said he decided to bring his followers to APC to the party better edge over the PDP in today’s election. “APC has never won in my polling units. Even the last Presidential and National Assembly elections, APC could not defeat us. The ruling party knows how strong I am in my ward but now that I have joined the party, I can assure the party (APC) that majority of the votes in my ward will be for APC,” he said. Olusesi, who said he controls nine units in his ward, promised to deliver all to APC. “I came to APC because of our leaders’ insincerity. They hobnob with APC in the night and still claimed to be PDP members in the day. Unfortunately, we are the people being used to them relevant. So, we decided to align with the APC. The nine polling units I delivered to the PDP at the last election will be for APC tomorrow. That’s my promised. Let the PDP know now that with God and my people behind me, those nine units will be delivered for APC. I did not come to APC because of financial inducement. Nobody gave me anything but I know I will not regret joining the party,” he said. Faleke described the duo as valuable to APC. Their coming into our party, he said, will give us leverage over the PDP in their areas. “We have reduced the strength of our opponents with their coming on board. They have seen the light and decided to join the progressive government. We welcome them wholeheartedly. We encourage others in PDP to join the APC and be part of the moving train,” Faleke said.